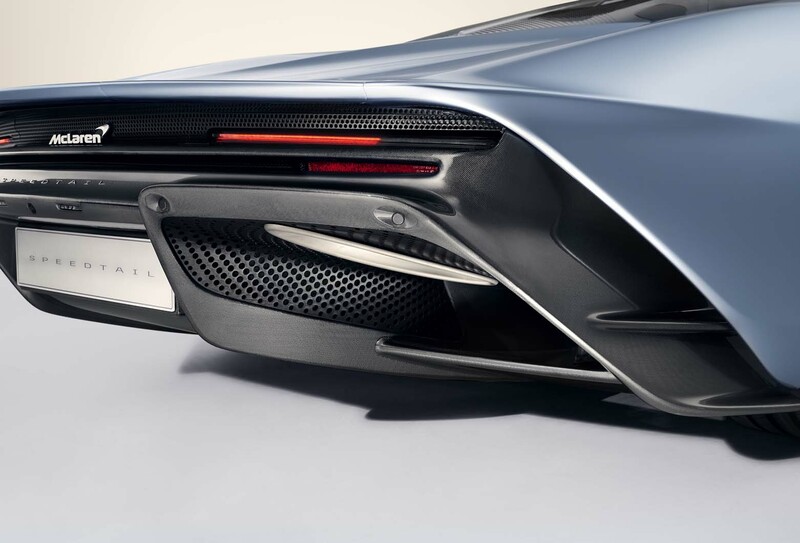 The rear clamshell is the largest single carbonfibre piece McLaren has produced, in order to minimise shutlines that will reduce aerodynamic efficiency. The hybrid battery can be recharged through a bespoke wireless charging pad. A large rear glass panel allows light into interior, with an electrochromic system turning it opaque as needed. Two active ailerons balance the car’s centre of pressure and downforce levels, adding stability at high speeds while acting as air brakes under deceleration. The new McLaren Speedtail will be the fastest car the firm has produced, with a 250mph top speed that will eclipse the legendary 243mph of the F1 – and the firm says it will also be a true driver’s car. The new machine is the latest in the Woking marque’s Ultimate Series and is the spiritual successor to the 1992 F1, featuring a similar three-seat cockpit with a central driving position. The Speedtail will be produced in a limited run of 106 models, matching the production run of the F1. All have already been sold at a cost of at least £1.75 million plus taxes each. The Speedtail’s 250mph top speed is short of the record 278mph achieved by the Koenigsegg Agera RS, but Andy Palmer, McLaren’s Ultimate Series vehicle line chief, said the car’s design as a hyper-GT meant the firm has no interest in chasing the record. “This is the first car that we’ve felt we could comfortably go beyond [the F1’s top speed] with," he said. "The 250mph speed is due to a balance of comfort and tyre [capabilities]. It’s still got to be a usable GT car, and there’s a trade-off. Speedtail buyers had their first chance to see a model of the car at a private event and McLaren has released limited technical details of the car. As well as the 250mph top speed, McLaren said it is the quickest-accelerating car it has produced. The Speedtail is capable of 0-186mph (300km/h) in 12.8sec, the firm said. By comparison, the P1 takes 16.5sec to reach that speed. McLaren is working with Pirelli to develop bespoke tyres for the Speedtail. Despite the top speed comparison, Palmer said the Speedtail wasn’t a 21st century version of the F1. “There’s the central driving position and 106-car run, but that’s really where the similarities end,” he said. The Speedtail’s power comes from an as-yet unspecified 1036bhp petrol-electric hybrid powertrain that will drive the rear wheels. The Speedtail is built around a bespoke carbonfibre monocoque that, in its lightest form, gives the car a dry weight of 1430kg. The top speed will be achieved through a special Velocity mode, which will optimise the powertrain to discharge maximum electric power and lower the car’s ride height by 35mm. To achieve the speed and acceleration targets, the Speedtail is streamlined to minimise drag for maximum aerodynamic efficiency. 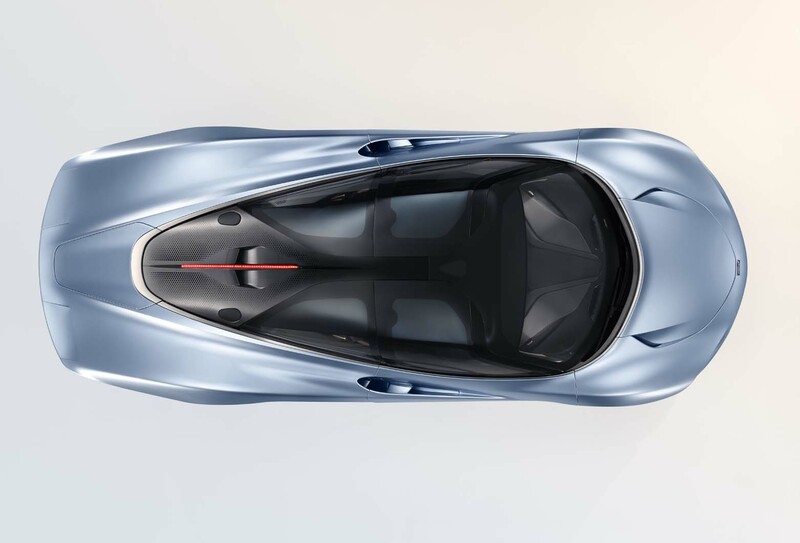 Thanks to its eponymous elongated rear end, the Speedtail is 5137mm long, 549mm longer than the P1. 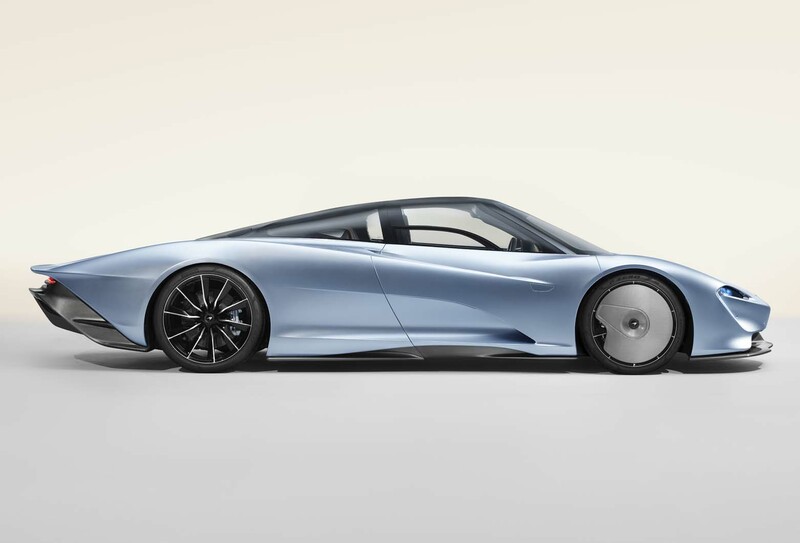 That is the only measurement the firm has given, but the Speedtail has a longer wheelbase than other McLaren models and is narrower than a P1 (1946mm). 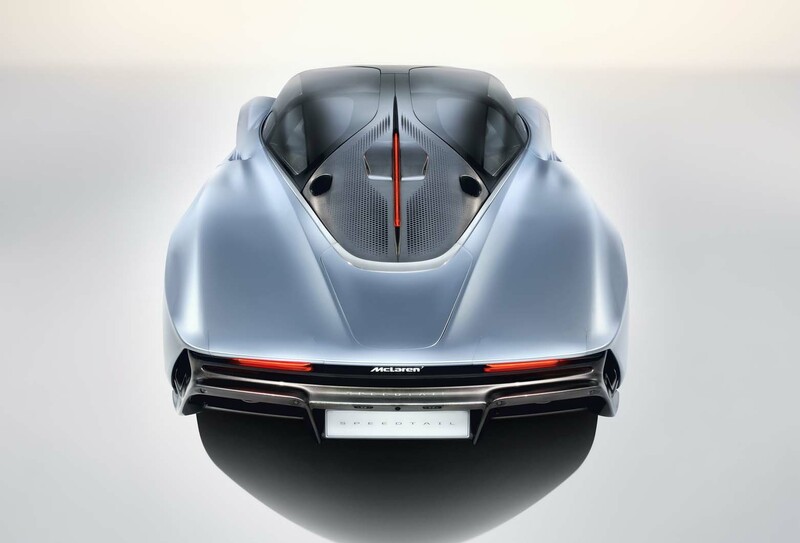 Unlike the recent McLaren Senna, which was a high-downforce car intended for optimal lap times, the heavily sculpted bodywork of the Speedtail has been aerodynamically optimised to reduce drag, with a particular focus on airflow. All of the Speedtail’s body panels are made of carbonfibre and McLaren has minimised their number to limit the need for shutlines and gaps. This has included creating a one-piece rear clamshell that is the largest carbonfibre bodywork element the firm has made. The rear clamshell also features two active rear ailerons, formed of flexible carbonfibre, which are automatically raised and lowered to ensure high stability while minimising drag. There are also a number of vents that help direct air over, through and under the car, along with a lengthy rear diffuser and flat underfloor. A series of other notable aerodynamic features include fixed front wheel covers and retractable rear-view cameras in place of mirrors. McLaren has already trialled the central driving position and various aerodynamic elements in a series of test mules, including ‘Albert’ – named after the first F1 test mule – which features a 720S front end with a Speedtail-style rear. Having driven the mule, Palmer said the car will be “breathtaking from a performance perspective”. The curved glass window is the largest to be used on a McLaren car and features electrochromic glass that can turn opaque, allowing the firm to forgo sun visors. A large glass rear panel is also used in order to maximise the amount of light inside the car. The interior of the Speedtail is accessed through McLaren’s traditional upward-opening doors, which will be mechanically powered for the first time. The two passenger seats are built into the carbonfibre monocoque for stability and to maximise space. On the design model, the Speedtail’s central carbonfibre driver’s seat is covered in lightweight aniline leather. There are three driver display screens, with climate controls on the left, driving info in the middle and infotainment on the right. There are also two screens for the rear-view cameras. To maximise use of space, many of the controls are located in a panel above the driver’s head. Because it is produced by McLaren’s Special Operations division, each Speedtail will be customised for its buyer, a process that will begin with each being invited to the McLaren Technology Centre in the coming months. Externally, the use of a new ‘titanium deposition carbonfibre’ weave technique means that a micron-thin layer of titanium – which can be anodised in any colour – can be fused into the bodywork, giving a chrome-effect shimmer. This technique also allows the bodywork to be customised in a way that allows, for example, buyers to write their name or provide an image, symbol or design for the flat floor. Unique stitch patterns and leather colours can be specified inside. The Speedtail is due to go into production in late 2019 after the production run of its Ultimate Series predecessor, the McLaren Senna GTR, finishes. The first customer deliveries will take place in early 2020. Palmer said that, unlike with other McLaren models, there will be no further variants of the Speedtail, such as a GTR version. However, he said the central driving position could be used on other new McLarens in the future, noting that “it does give a very different driving experience”. The Speedtail is the first of 18 new cars that will be part of McLaren’s ‘Track 25’ business plan, which runs until 2025. Palmer confirmed that a successor to the P1 hypercar will be one of the final models of that plan. What was the inspiration for the Speedtail? How much difference do features like the fixed wheel covers and rear-view cameras make? Did you look at the original F1 for inspiration? How exciting is this project for a designer? So presume they'll pretty much going to stay. Where were you when the Speedtail was launched? Breathtakingly beautiful. McLaren, somehow, has done it again. I know a good opticians. Getting 106 tasteless rich people to buy this hideous beast. That must be a landmark. I assume by your name you aspire after a Lamborghini? Since the Countach, if ever there was a brand that appealed to the tastless elite it was Lamborghini. Not a criticism, BTW, just a hard fact. What is wrong with people? A car built by talented engineers for those fortunate enough to afford them for their own satisfaction. If I choose to have an ugly, tastless (and expensive) car/dog/watch/wife why does it irk other folks so much? Jealousy? Everyone is entitled to their opinion but to criticise a personal choice that has no impact on another persons life is pure spite. There was a purity to Gordon's design of the F1. Everything was carefully considered and choosen on its engineering abilities. Not to be the fastest car, but to be the ultimate super car. It redefined what a super car was and probably why we now call them hyper cars! 240mph top speed (two-way, the official figure) was an accident. It wasn't the outright purpose of the F1. 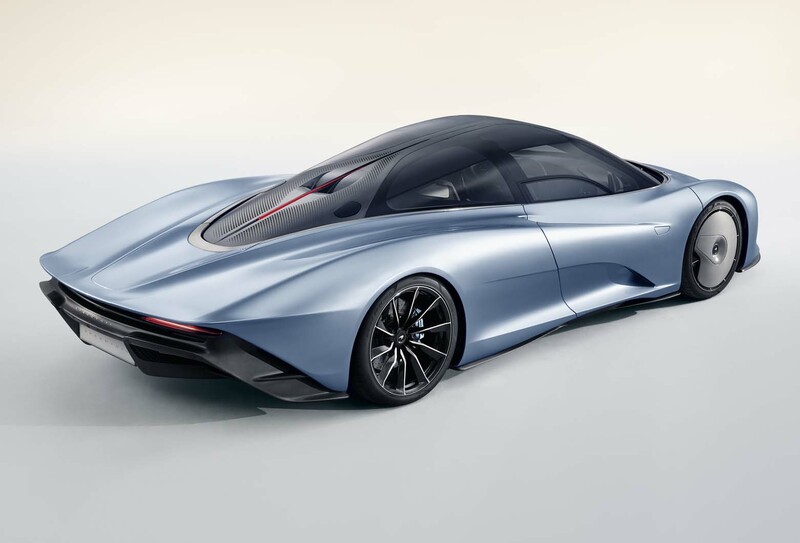 With this Speedtail the name is suggesting it should be quick. The claims of being aerodynamically optimised for speed backs that up further. Yet McLaren claim outright speed isn't a priority? Someone got the wrong memo! So it's a bit confused. Is it a GT or is it supposed to be a fast car? And being confused it's compromised both. And that really is the impression I get. The car is compromised. However, the ultra futuristic look of the interior is amazing! Sorry, but this isn’t by any stretch of the imagination a beautiful Car, from the side it’s more Le-mans bit like a Porsche 956/962 , the interior, well, look at those A’ pillars, the F1 three seat arrangement?, looks a bit cosy to me, no, I think it could have been done better, maybe it’s the color they’ve painted it?, a first glance it reminds me of the Jaguar 220. I think it looks good. Distinctive and extravagant, much more of the ethos of a modern Bugatti than the Chiron. That's what makes cars emotive subjects compared to other commodity purchases, can't imagine there's many forums that create so many comments when Hotpoint launch a new dishwasher! Everyone has an opinion, everyone is right and wrong, most negative commentators probably couldn't afford the object of their derision anyway. ...This is one ugly bugger, looks to be inspired by that other ugly lump, the XJ220.....26 years later after the F1 launched and what have they acheived....7 mph!! Shows how advanced the F1 was at the time. Not only was it better looking, it was far more practical....it even had luggage space for christs sake, it was smaller, neater and didnt need stupid ugly front wheel covers to achieve it max velocity and rear view 'camera's' in lieu of mirrors!